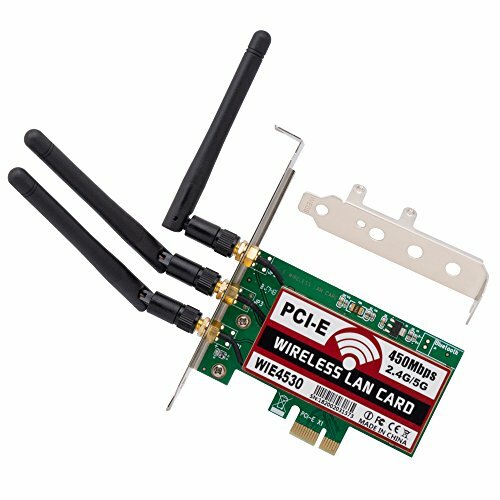 QNINE 450Mbps Wireless PCI-E Express Card, WiFi Network Antenna LAN Adapter with 3PCS Antenna for Windows 7/8/10 by QNINE at AABX. MPN: Q_pcie_wifi. Hurry! Limited time offer. Offer valid only while supplies last. Add Wireless Adapter to Desktop Computer--Say Goodbye to Wired Internet Cable, Move Your Desk top Computer Anywhere You Want. Wireless transmission rate up to 450Mbps full speed. Separate detachable 3pcs antenna design, free to change, makes the signal stronger. Complies with IEEE 802.11n, IEEE 802.11g, IEEE 802.11b standards. Supports analog AP transmitter function. Support 64/128/152 bit WEP encryption, support for advanced encryption and security mechanisms such as WPA / WPA2, WPA-PSK / WPA2-PSK. Support WPS function, easy to set wireless security.